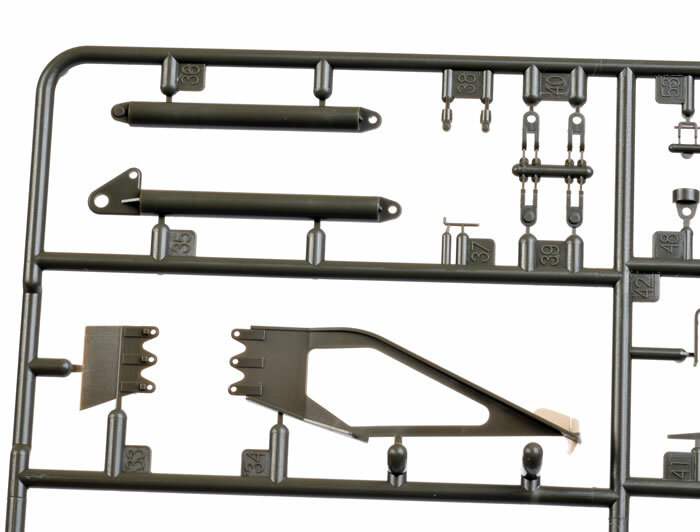 818 parts in dark green plastic; 16 parts in clear plastic, one fret of photo-etched parts; four lengths of flexible tracks; two lengths of string; one sheet of black flexible material; markings for two vehicles. 6510 Yen available online from Tasca and hobby shops worldwide. 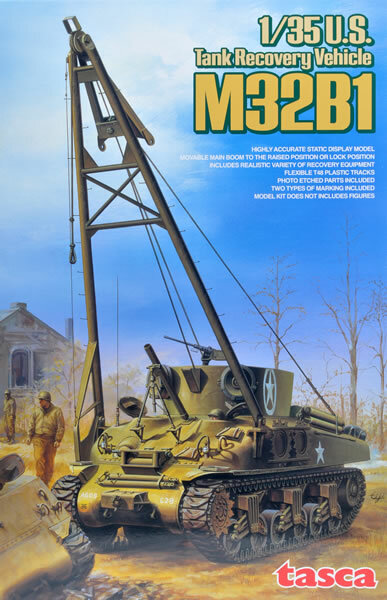 Accurate; impressive subject; main boom and A-frame may be posed raised or lowered; useful options and accessories; excellent detail; articulated suspension. Tasca has not quite run out of Sherman gun tank variants yet, but they have taken an interesting direction for their latest release. The successor to the M3 Lee-based M31 Tank Recovery Vehicle was the M32. The first variant, the M32B1, was built on the early Sherman M4A1 cast hull with the small oval hatches. The majority of M32 Tank Recovery Vehicles were converted from existing gun tanks. 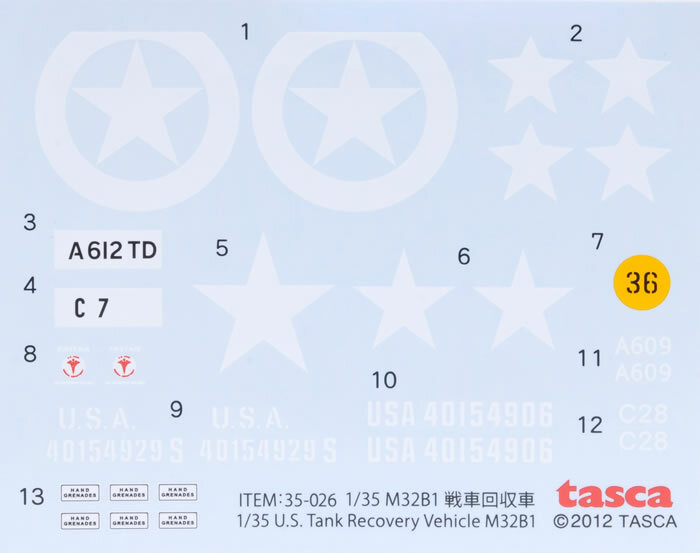 Tasca’s 1:35 scale M32B1 Tank Recovery Vehicle is correctly based on the early M4A1 cast hull and VVSS suspension. 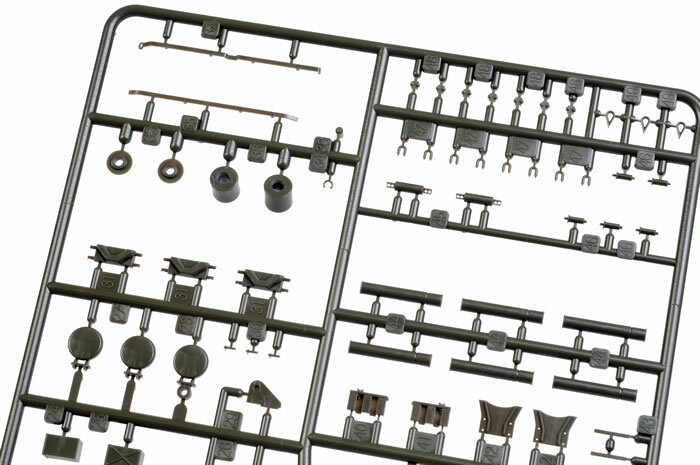 The kit comprises more than 800 parts in dark green plastic, 16 parts in clear plastic; four lengths of black vinyl tracks, a modest photo-etched fret, two lengths of string and markings for two vehicles. 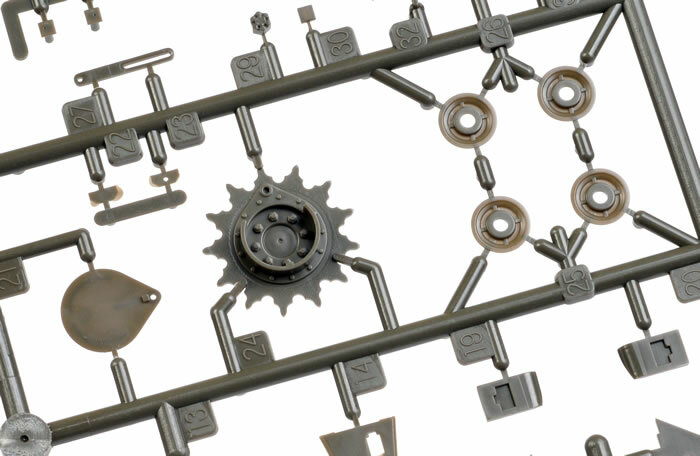 The whopping parts count incudes a large number of pieces not used for the M32. This will be a nice bonus for your Sherman spares box. 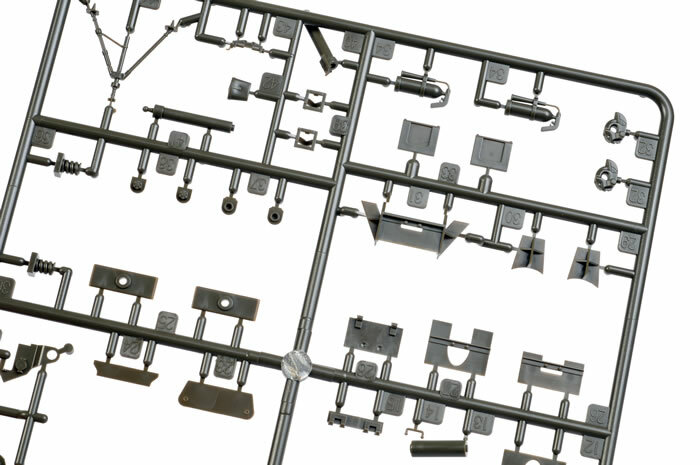 As with all of their previous kits, moulding quaity is first rate, with fine crisp details and cast texture moulded in place where approporiate. 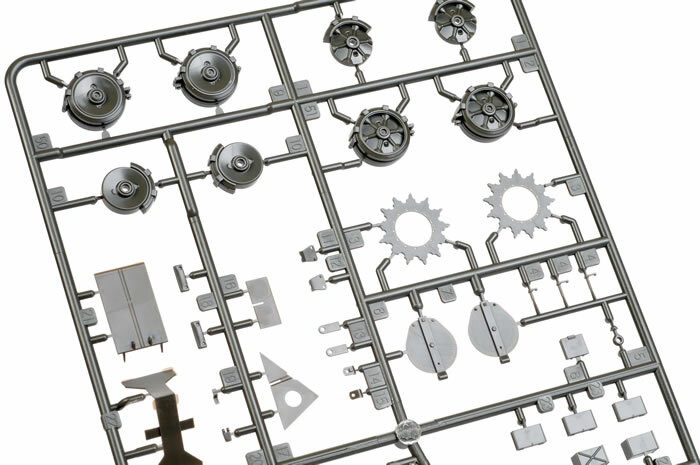 Five new sprues are included with this kit. They contain the big main boom, the A-frame, interior detail and unique hull fittings amongst a myriad of new parts. 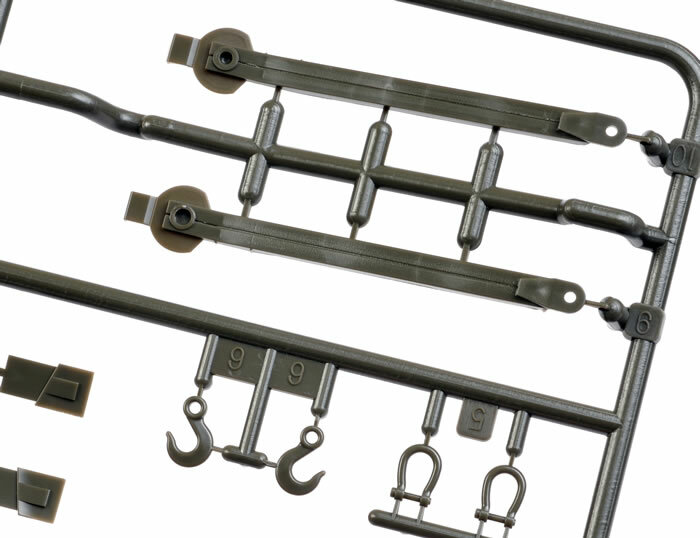 A tow hook and stowed towing bar are supplied for the transmission cover; while the interior is well fitted out with stowage, a big winch and authentic raised treadplate flooring. 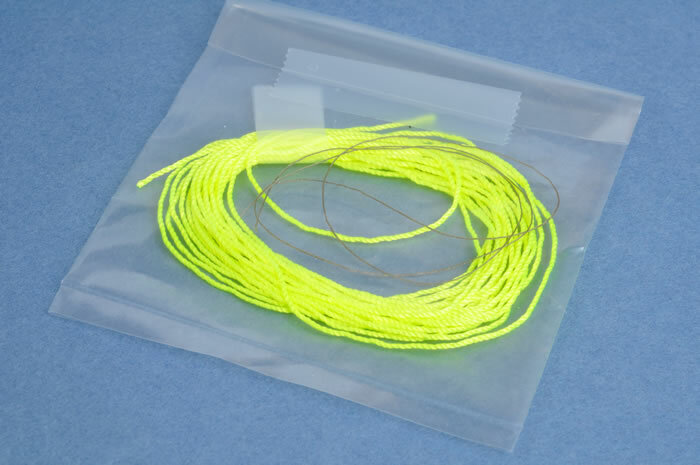 A length of gaudy yellow-green string is supplied to be wrapped around the winch drum, then rigged up to the boom and the hull. External stowage boxes unique to the M32 are also provided. Another nice touch is the inclusion of chocks, which were typically employed when the main boom was raised. 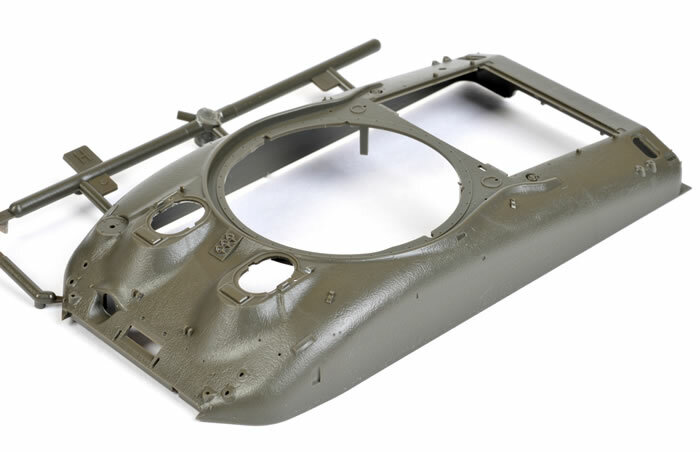 The fixed turret is another all new sub-assembly. This features a high level of detail inside and out, including spare wheels and track links, and a Commander’s hatch that may be posed open or closed. 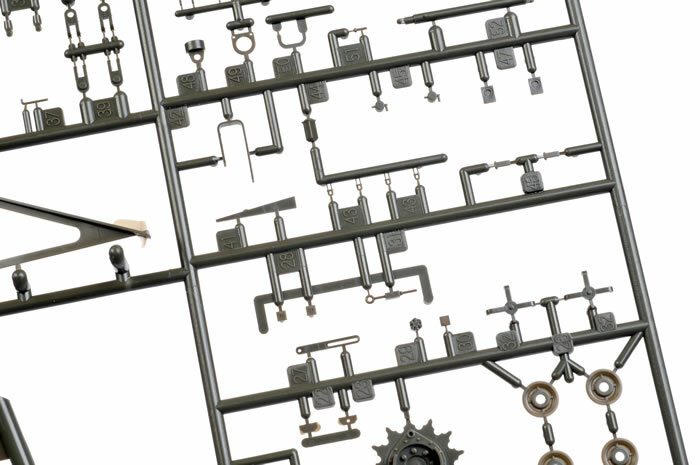 The main boom and the A frame both feature workable hinges and rollers, but the cable rigging means that, in practice, most modellers will choose to pose the boom either raised or lowered (stowed). Tasca’s lovely M2 .50 cal machine gun is included, as is an M1 80mm mortar for fitting to the front of the hull. Four petrol and water cans are also supplied. 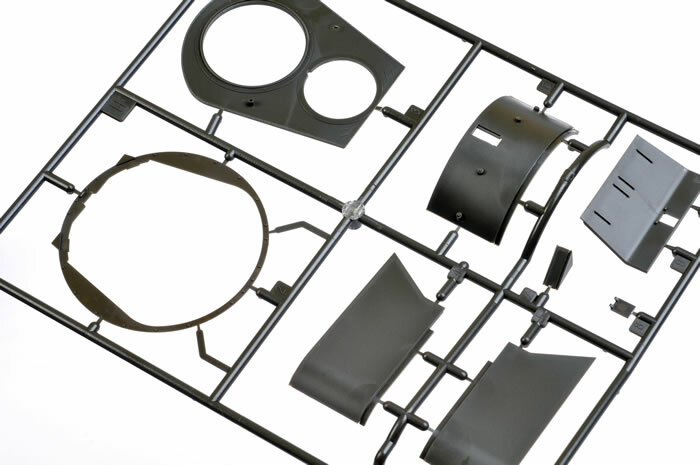 The photo-etched fret incudes mesh and grilles for the grouser housings. 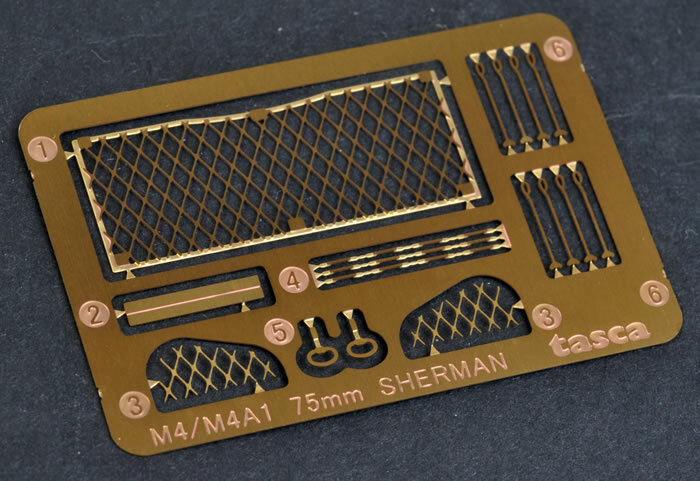 Many of the sprues will be familiar to modellers who have previously built any of Tasca’s Sherman kits, especially the M4A1s. Optional pressed or lace road wheels are supplied for the mid-production, straight-armed VVSS bogies. 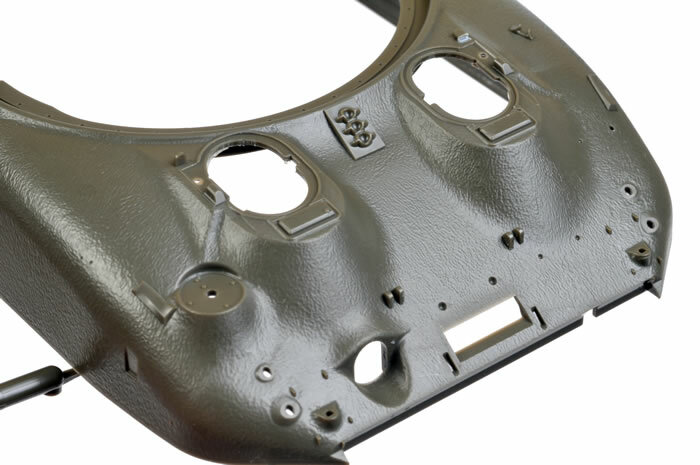 As always, foam is supplied to permit movement of the suspension arms after assembly, but this may be replaced with solid plastic if you would prefer to immobilise the bogies. The flat-pack lower hull, transmission cover, engine deck and exhausts have all been seen before too. 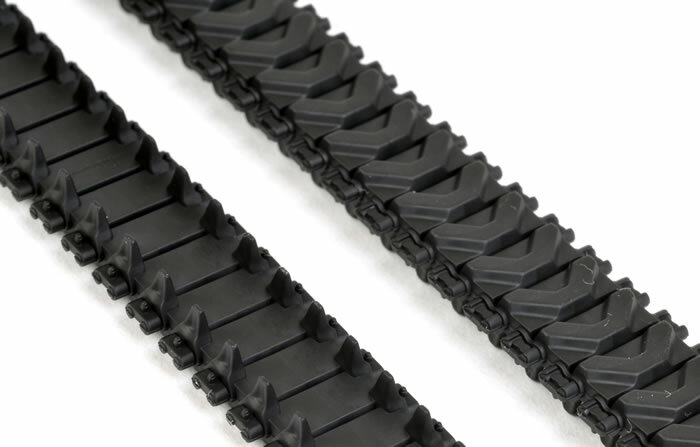 T48 rubber chevron tracks are supplied this time around. As usual, these are broken down into two flexible vinyl lengths per side, but unlike earlier releases they are moulded in black. They seem a bit softer and more flexible than the brown vinyl tracks, but this may be a psychological effect of the colour. 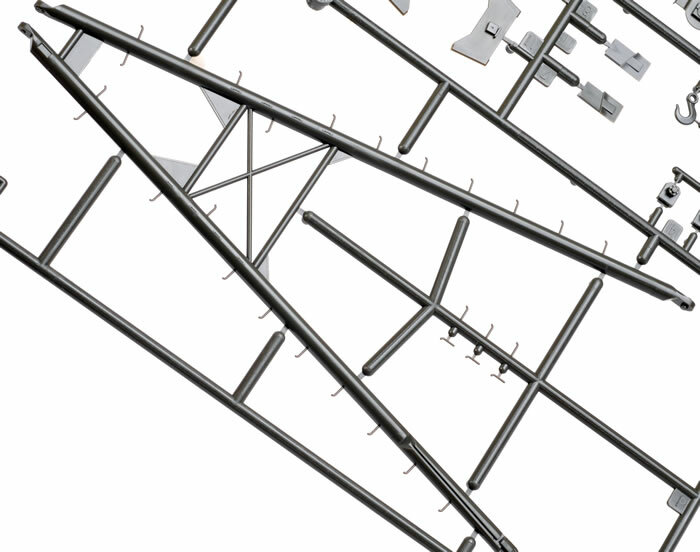 Tasca’s tracks may be glued together with standard model cement. Not only are they easy to assemble, but they also look great on the vehicle. Instructions are spread over 40 steps and 16 pages. The illustrations are quite clear and the supplementary written tips will be helpful during assembly. Both vehicles are finished in overall Olive Drab. I was genuinely excited to see this kit land on my doorstep. Tasca's last Sherman release was their Korean War "Easy Eight" around this time last year. The gap between that release and this just makes it even more welcome to Sherman, ARV and US armour fans. Tasca’s 1:35 scale M32B1 Tank Recovery Vehicle is their most complex and ambitious model to date. Until now, there has never been an accurate M32 model from a mainstream manufacturer. Italeri’s M32B1 was actually an odd hybrid based on a late M4A1 hull, so it was not really representative of the typical wartime configuration. Detail was sparse too. Tasca’s M32B1 is anything but sparse. 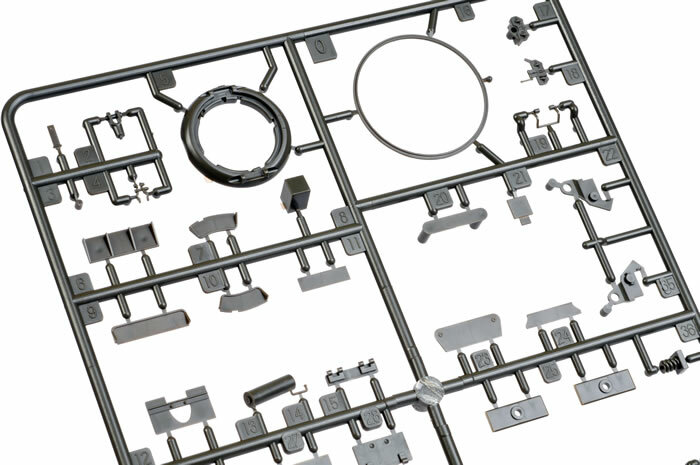 It will look great straight from the box, and will also be an excellent base for superdetailing and diorama projects. It is very pleasing to see Tasca’s slightly lateral lunge toward the M32. I wonder what they’ll do next?